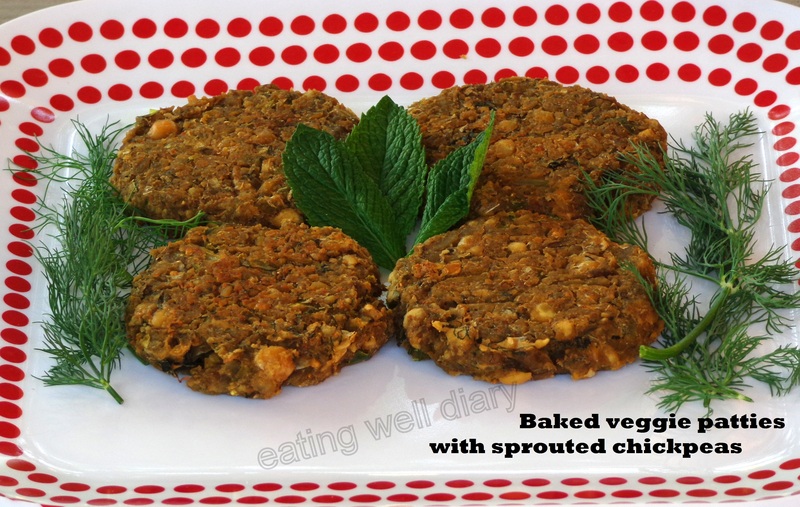 Another way to use sprouted chickpeas if you have them in your refrigerator, like I did, a few days ago! We are big fans of Trader Joe’s masala burgers in my house and try to get as many boxes as would fit in the freezer when we visit the store (50 miles away). I have got tired of doing that, I wanted to make my own burgers, and I’m very glad I did. I am not trying to recreate their burgers here, this is just my own baked burger or ‘cutlet’ packed with protein and flavored with spices and herbs. 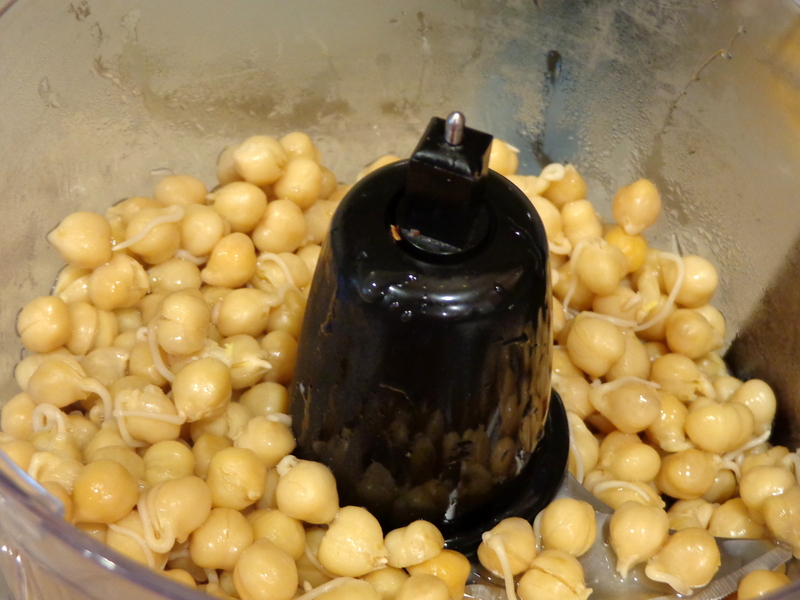 The chickpeas don’t have to be sprouted of course, I do it because I’m a sprouting fanatic! I wanted to make these vegan, grain-free and use minimum amount of oil. I used nutritional yeast flakes to add a cheese-like flavor and to hold the burger together (it may not be necessary, since there is starch in the potato that would be enough to bind) It really complements the flavors of herbs and does not overpower it. My daughter does not like the taste of the yeast flakes, but she ate these with glee! I have been able to store these in the fridge for 5 days. Just took them out when needed, brushed with oil on both sides and heated on a pan- they are as good as fresh! I’m pretty sure these could be frozen for a few weeks. Bringing these to Fiesta Friday #16, the party at The Novice Gardener’s hosted by Elaine of Food Bod and Stacey of 10 Legs In the Kitchen. Thank you, my friends, for hosting! On a pan lined with parchment paper, sprayed with organic canola oil. Bake for 15 minutes, flip, spray/brush with oil and bake again for 15 minutes. 1. Cook chickpeas and while it cools, chop vegetables, grate potatoes and keep the other ingredients ready. 2. 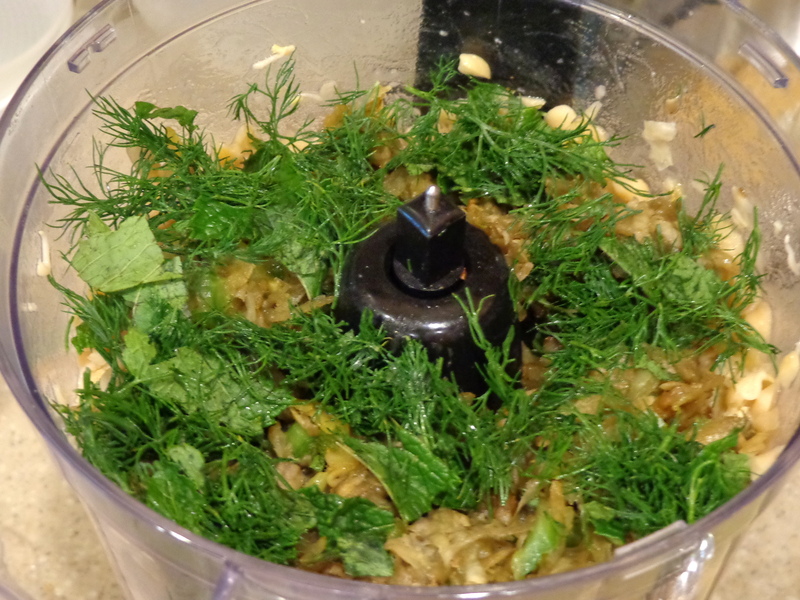 In a food processor, add chickpeas, pulse, add grated potatoes, veggies chopped dill, mint, spices and salt, pulse again. 3. Preheat oven to 350 °F. Line a baking/cookie sheet with parchment paper. 4. 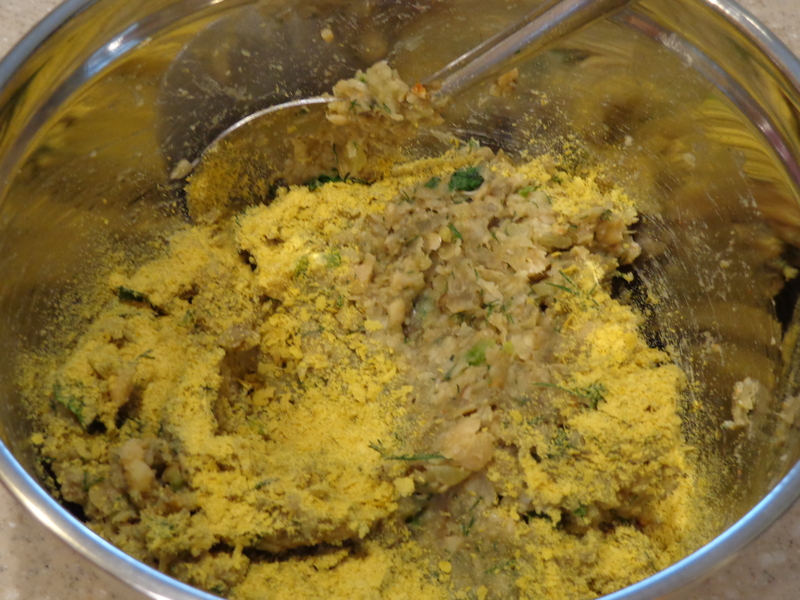 Add nutritional yeast flakes to the bowl, mix well and form patties. 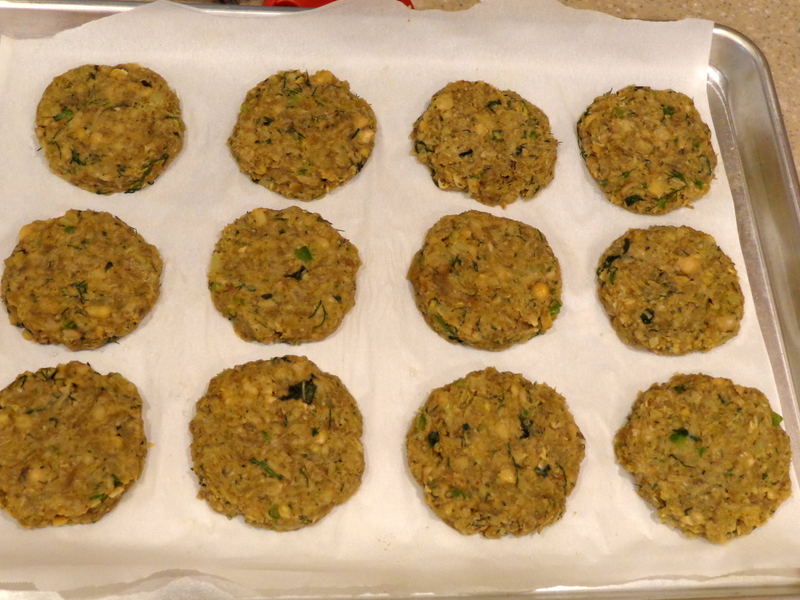 It is a good idea to roll the mixture in one hand and keep the other hand wet with some water so that the patties can be formed once transferred onto the baking sheet. 5. Brush/spray the patties with organic canola oil. Bake for 15 minutes, flip, brush/spray with oil and bake again for 15 minutes. 6. Serve with tomato ketchup just plain or in a burger. These sound great and very versatile. I have never heard of mango powder, so shall go on a hunt for it this weekend! Hi Emma, thanks for the comment! 🙂 You’d find dry mango powder,also called “amchur” in an Indian shop. It adds a tangy sourness. It sounds really great – thank you, I’ll get some and try it! Lovely Apsara! I have never tried sprouting chickpeas but this looks delish. 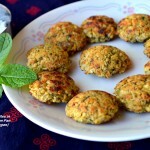 I love my morning star black bean burgers but I will try them with chickpeas now :). I like it but there is nothing better than the home made. They look so yummy and crunchy. We just soaked and boiled some chickpeas yesterday.Will try making these with the boiled ones and leave the sprouting for next time. 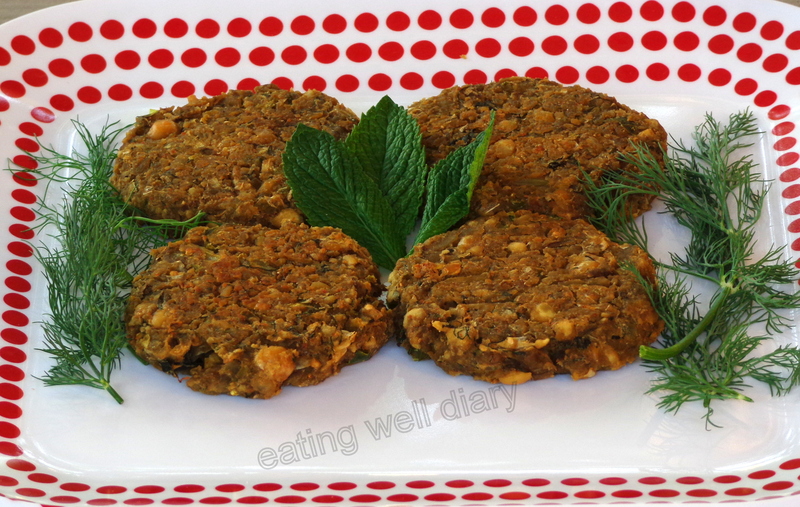 These veggie patties look delicious and not too heavy like some patties are. thanks, Jovina. Yes they are light, I could eat 4 just for a snack! This looks really, yummy! I love patties! This look really good: I love chickpeas, and any chickpea recipe has to be good just because it is! true. It blends into anything, doesn’t it? love this recipe! I do it for my kids! thanks for bringing her Fiesta Friday! 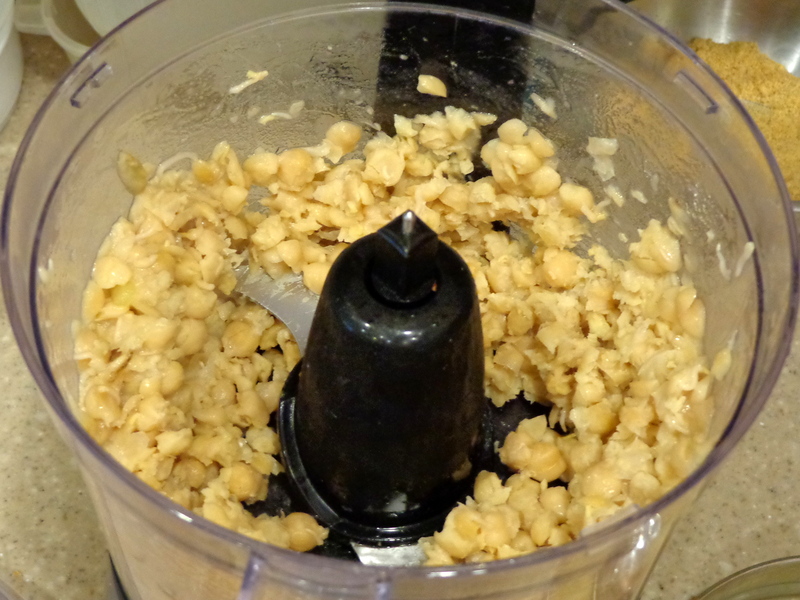 I still have never done anything with chickpeas…curious about them. These definitely look good Apsara! These look so good! I’ve never heard of mango powder either, but it’s definitely something I’m going to check out now! Apsara, very good receipe like our masal vadai. Your hightech cooking with, oven, yeast, dil etc. Does not work here. So want to try on Dosa pan, instead of deep fry. The ingredients, coriander and curry leaves, grated carrot, green peas gently pressed, grated cabbage, grated ginger, green chilly paste or pieces (sauted with minimum oil to get rid of the raw smell), add to ground sprouted chick peace, salt to taste.cook on shallow pan with minimum oil, flip and cook/shallow fry on either side. (Avoid chillies for kidds). Side katta meeta sauce. You know this is a wonderful take on masal wade served down South! I like how you make everything healthier. I am gonna try this method of yours. I am so on this one! Love the chickpea. Wow Apsara! This looks great…just one question – What is this nutritional yeast flakes? I dont know if we get that here. Can I leave that out? 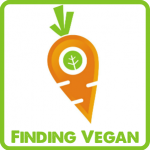 It’s a byproduct of molasses sold here, that vegans use as a substitute for cheese because of the flavor. It is a good source of B vitamins, esp. B-12 that is hard to get in a vegetarian/vegan diet. You can leave it out, the patties will come out well even then! Apsara – I love how you have made this so healthy with lots of flavour. Does sprouting the chickpeas make any difference in flavour? Thanks so much for bringing these to the party – I hope you have brought enough to feed these hungry hordes! Summer is around the corner and burgers will be on the menu at home…so this recipe will be handy. I like the addition of dill to get a distinct new flavour! I will make these tasty beauties but will enjoy them as burgers in a bun! Yum yum yummm! Healthy and yummy cutlets. Looks delicious. thank you, Gayathri. I just visited your blog too, you have an excellent collection of recipes. Wish WP and Blogger bloggers could connect on a common platform!